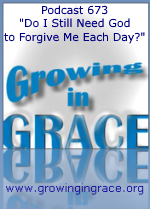 Growing in Grace Podcast: 673. "Do I Still Need God to Forgive Me Each Day?" The subject of forgiveness has been a common guest on our program over the years. Even believers in Jesus Christ will often struggle with whether they are truly forgiven or wonder where they stand with God. In their minds they may ponder whether they are they forgiven only up until this moment - until another sinful thought or action occurs. Have they confessed everything? Of course they haven’t confessed all of their sins - and we should ask if that activity even brings a renewed forgiveness from God. When contrasting the Old Covenant to the New, we find quite a contrast as the book of Hebrews explains the true power of the blood of Jesus that was shed just one time. The Jewish people were unable to rest in God’s forgiveness. Why? Because they had to keep seeking a renewed forgiveness on a daily basis. It’s likely we haven’t fully understood what occurred on that cross when Jesus died and uttered the words, “It is finished.” The good news is far better than we think, and it’s why we live in something called a better covenant, established upon better promises.